When Duke Ellington’s band worked on New Years Eveand it usually didat midnight Ellington nodded casually to his musicians and they performed the newest variation on their head arrangement of “Auld Lang Syne.” As you listen to the 1962 studio version, please know that the Rifftides staff does love you madly and wishes you a perfect 2015. We wish you the same, Doug! Living in France, we are not there yet. But Duke Ellington, what a great idea. He is my hero. Unfortunately, your video does not work, neither on YouYube. So the global waves must be tired. Thank you for all your posts during the year, always a pleasure for me in the morning when I open up the PC. And I followed up lots of your suggestions, too. Have a nice year 2015 and lots of more good ideas. All best wishes to you and yours for 2015And thanks for the memories! Of all things, this was the last tune I’d thought of getting a Dukish rendition … but I also didn’t know about his splendid version of the antique swing war horse “IN THE MOOD” until I discovered it on one of his Capitol LP’s. HAPPY NEW YEAR to all of you “Rifftides-ers”!!! This is marvelous — a joy to behold! Speaking of which… FLASHBACK to New Year’s Eve 1983 with Chicago’s late, great saxophonist VON FREEMAN. A segment of “Auld Lang Syne” is at the end of this video. My day is not complete without checking out your blog. Actually, “blog” does not fully describe the great jazz journalism that you present here, day in and day out. Thanks for years of great jazz coverage. You are a national treasure. Happy New Year, Doug Ramsey, from King City, CA. Same to you, Doug, and thanks for all the great coverage in 2014. I don’t comment often, but I do check your writings/recommendations out frequently. Keep up the good jazz fight. Doug: so grateful for all you do for us jazz junkies. 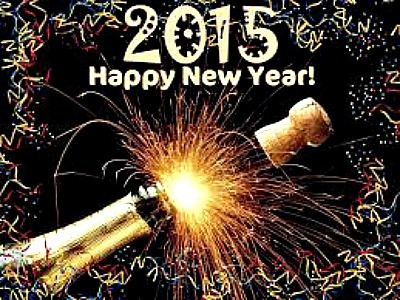 Wishing you and your family a happy and healthy 2015. Wasn’t it just recently 2000?!? Happy New Year Doug, also to all the rifftidesoroonies! Thank you so much for this excellent jazz gem that you host for all of us, as Valerie said, ‘jazz junkies’!